11:00 a.m. – 1:15 p.m. In the spirit of women’s empowerment, this luncheon is designed to help women receive support for their professional development. This luncheon will foster mentoring relationships between attendees, and participants will hear insightful stories from trailblazing female leaders across the country. Speakers will address key issues facing women and how to create lasting change in our communities. Attend this luncheon to network, build relationships, and support female economic development professionals, because, "The Future is Female"! 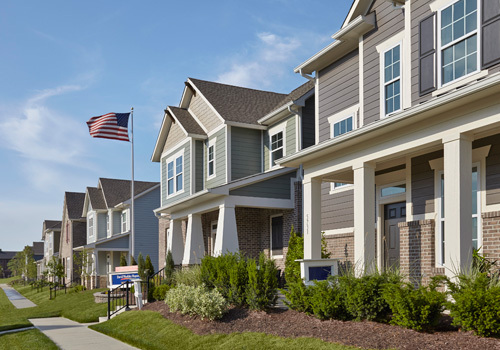 12:45 p.m. - 4:00 p.m.
Carmel is the fastest growing city in the fastest growing county in Indiana. Since 2004, redevelopment of the Arts & Design, Midtown, City Center, and Center for the Performing Arts districts has attracted more than $350 million in private development, resulting in $110 million in economic activity throughout Hamilton County from the Arts & Design District and City Center alone; 3,300 new jobs; more than 100 new corporate headquarters relocating to the area; and nearly 1,000 new housing units. 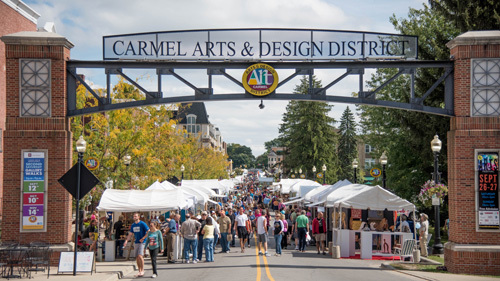 Carmel is regularly recognized as a top place to live, work, and play in national and online publications, with incredibly high scores for walkability, bike friendliness, lively arts and entertainment culture, and other workforce-enticing accommodations. In 2018 Money magazine ranked Carmel the #1 Best Place in the U.S. to Launch a Career, touting a projected 11.6% job growth between 2016 and 2021. Mayor Jim Brainard will lead this exciting walking tour, sharing his own insights into why Carmel has been so successful on so many fronts, and how other small and mid-size cities can replicate these efforts. 1:45 p.m. - 5:00 p.m.
Grand Park is 400-acre sports tournament campus located in Westfield, the Indy Metro region’s northernmost city. Grand Park was created as an economic development engine for the city and has triggered upwards of $700 million in new commercial investment since its inception in 2014. 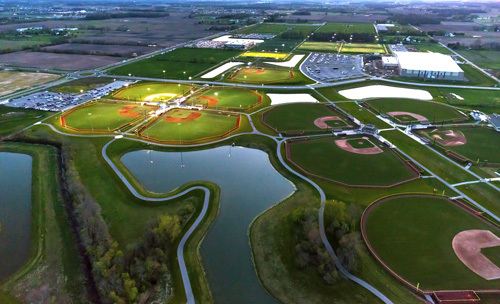 The park includes 26 baseball and softball diamond fields, 31 soccer/multi-purpose fields, and 3 full-size soccer fields. Grand Park was recently selected as the long-term home of the Indianapolis Colts Training Camp which it began hosting during the 2018 NFL season. The sports campus saw close to 2 million visits in 2017, and regularly hosts national sporting events such as the Big Ten Soccer Championships and regional Little League tournaments. The tour will include a walking tour of the Grand Park Events Center and a bus tour of the campus with presentations from Mayor Andy Cook, Grand Park Director William Knox, and Economic Development Director Amanda Rubadue. Are you faced with ethical dilemmas in your professional life? Do you have the tools to deal with ethical issues? Economic developers regularly encounter situations that require sound judgment and strength of character. Saying no is not always easy but may be the right thing to do. This session will provide essential instruction on ethics in economic development and will provide you with the tools to foster a culture of high standards in your organization. No theoretical lecture, this workshop will focus on real life ethical situations faced by economic developers where your decisions could mean the difference between success and failure in your career and life. Note: Due to the large number of attendees at these workshops, we are unable to accommodate requests to transfer registration between the Sunday and Monday ethics sessions. Ethics Workshops will also be held at the 2020 Leadership Summit in Tampa, February 9-11, 2020 and at the 2020 Annual Conference in Dallas, October 11-14, 2020. Ethics training is a requirement for the Certified Economic Developer (CEcD) recertification processes. CEcDs who seek recertification are required to have two hours of ethics training each time they recertify. Interested in learning how to successfully navigate your first IEDC Annual Conference? Find everything you need to know to make the most of your time and experience at this event, IEDC's largest annual gathering of economic developers from around the world. This event will be followed by a networking opportunity for attendees to meet IEDC Board and Advisory Committee members prior to joining everyone for the Chairman's reception. Join us and connect with other new IEDC members, members of the IEDC Board of Directors and Membership development Advisory Committee. Learn more about IEDC member benefits and resources, along with information on the Accredited Economic Development Organization (AEDO) program, Certified Economic Developer (CEcD) credential, Excellence in Economic Awards and other ways to become more involved through IEDC's advisory committees. The Internet of Things (IoT) makes things smarter. A ‘thing’ is defined as any object used in daily life that can connect to the internet to collect and share data. The Internet of Things uses that data to make the ‘thing’ more efficient or beneficial for our lives. 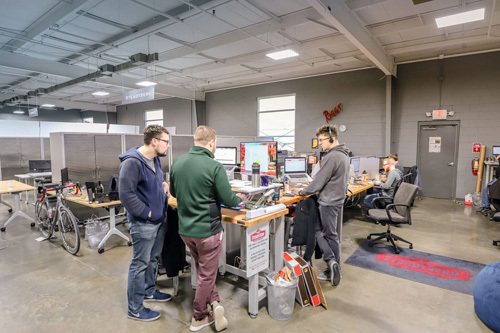 An IoT lab builds connections between established Indiana industries and local tech companies specializing in IoT. Founder and CEO John Wechsler will provide an overview and history of the Fishers IoT Lab along with a description of how it is building those connections between some of Indiana’s most innovative companies, impacting job growth, and attracting a new and vibrant workforce. This unique mentorship opportunity should not be missed. Students and young professionals will meet and interact with seasoned economic developers. Mentors come from a variety of backgrounds and have a wealth of experience to share. Students and young professionals bring new energy that experienced economic developers find exciting for the profession. After the initial mentorship session, participants will have the opportunity to sit and have lunch together to continue conversations and make more lasting connections. Box lunches will be provided. Note: Registration is free, but limited to students and professionals 35 years of age or younger. Mentors will be selected by invitation. Legalizing cannabis on the federal level could result in an additional $105.6 billion between 2017 and 2025, according to a recent report from the cannabis analytics firm New Frontier. That figure includes projections for business tax revenues, payroll withholdings, and a 15% sales tax. Meanwhile, fully legalizing cannabis today would add 654,000 jobs and up to 1 million jobs by 2025. It's clear that cannabis can be a boom to local economies with robust regulatory regimes in place. But lawmakers should be wary of legalization solely for the potential economic benefits. Join us for a candid panel discussion on the pros and cons of legalizing cannabis and how it has impacted communities across the country. IEDC extends a special welcome to elected officials and members of EDO boards. Economic development is the most prevalent major policy issue across speeches, and has been for the past five years, according to the State of the Cities 2018 report. Join this luncheon to network and discuss economic development issues, trends, and strategies in your community. All registered attendees of the conference are invited to register. 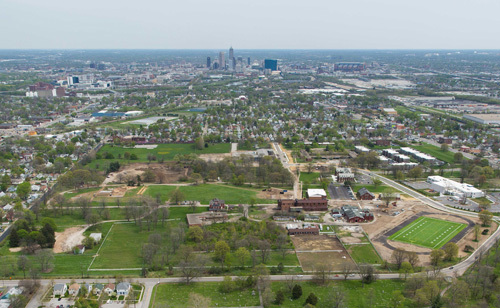 Explore the preservation, reuse, and redevelopment of the former Fort Benjamin Harrison military base, its rebranding as "Fort Ben", and the challenges and successes of creating a new city center for the city of Lawrence. This bus and light walking tour will be led by Aletha Dunston, Executive Director of Fort Benjamin Harrison Reuse Authority, and Chris Barnett, Executive Director of the Lawrence Community Development Corporation. Stops and points of interest will include an overview of redevelopment on Indianapolis’ east side; a walk through the historic Lawton Loop residential area with a discussion about redevelopment restrictions in historic districts led by Ashley Thomas, Historic Architecture Specialist with the Indiana Department of Natural Resources; an overview of activities within the Fort Harrison State Park; and a walk-through of Lawrence Village, the primary redevelopment area of the Fort with Kim Reeves, Vice President of Development Services at Browning Investments, who will speak about the intent of planned unit development, public infrastructure investments, and the plan for new development. Central Greens is a 150-acre redevelopment of a former state-owned mental hospital campus known as Central State Hospital, located on the near west side of Indianapolis. Ongoing development for this self-proclaimed “mixed use village” includes greenspace, housing, recreational sports fields, retail, makerspaces, artisan manufacturing, event space, a charter school, and more, with a complex financing mechanism that is driving economic development on the city’s west side. Since 2007 the site has attracted more the $80 million in public, private, and nonprofit investment. Central State truly offers live, work, and play experiences while also connecting with nature. The site features majestic mature trees, natural wildlife, and roaming horse pastures. The tour will be led by Central Greens Master Developer Derek Naber of Holladay Properties, who will speak on infrastructure bonds, housing strategy, etc. Points of interest will include Cristel House, single family home developments, makerspaces, and event spaces, all located within the Central Greens redevelopment area. Join IEDC and your peers in honoring outstanding community and economic development leaders. Honors to be conferred are: - Fellow Members (FM) - Honorary Life Members (HLM) - Young Economic Development Professional of the Year - Leadership Award for Public Service - Citizen Leadership Award - Institutional Leadership Award - Jeffrey A. Finkle Organizational Leadership Award - Lifetime Achievement Award for Excellence in Economic Development. Travel time between the Indiana Convention Center and the Palladium is approximately 45 minutes. Transportation will be provided. If you are planning to sit for the Certified Economic Developer (CEcD) exam, it's never too early to start planning and learning more about the process. All participants and attendees at this workshop will be provided with a complete overview of the Certified Economic Developer (CEcD) exam process, from application to the oral examination. Attendees will learn tools and techniques for preparing for the exam and witness a mock oral interview. Note: First-time candidates sitting for the certification exam are required to participate in the "Preparing for the CEcD Exam Workshop," either in-person or via webinar format. Questions regarding this requirement can be sent to certification@iedconline.org. 8:15 a.m. - 11:30 a.m.
Speedway has been home to the Indianapolis 500 - The Greatest Spectacle in Racing - since 1911. 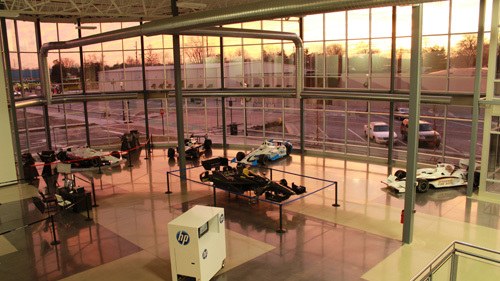 Racing literally built the town of Speedway, but together this small town and big race have had a huge impact on economic development in and around Indianapolis. Led by Speedway's Economic Development Director Tim Gropp, this bus and light walking tour will include a discussion of activity on the city's near west side, including White River State Park, Indiana University / Purdue University at Indianapolis (IUPUI), White River clean-up efforts, and other area developments; a stop at Allison Transmission World Headquarters; a drive through historic Speedway; a tour of Dallara IndyCar Factory's "interactive zone"; discussion of redevelopment efforts of Wilshaw Development, a $36 million mixed-use development site; and the Indianapolis Motor Speedway. 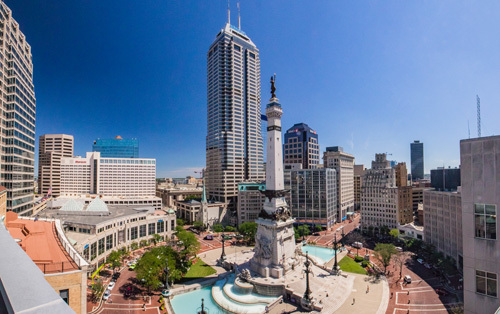 This walking tour through the heart of Downtown Indianapolis will focus on a range of technologically and economically innovative companies located at the city’s core. Led by Indianapolis Deputy Mayor for Economic Development Angela Smith Jones and Studio Science CEO Steve Pruden, stops will include Emarsys North America, Salesforce Tower, High Alpha Venture Studio, Home Advisor/ANGI HomeServices, Kronos, and portions of the Indianapolis Cultural Trail.